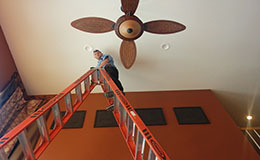 The ceiling in your home is 20 feet tall and the time has come for that outdated foyer light fixture to go. You go to the box store and find a great deal on a light fixture you like, buy it and bring it home. But with a ceiling 20′ high you ask yourself, “Do I call an astronaut or an electrician…?” Let me answer that one for you – give Edison Electric a call!